The More Things Change...: How Far Back Does It Go? 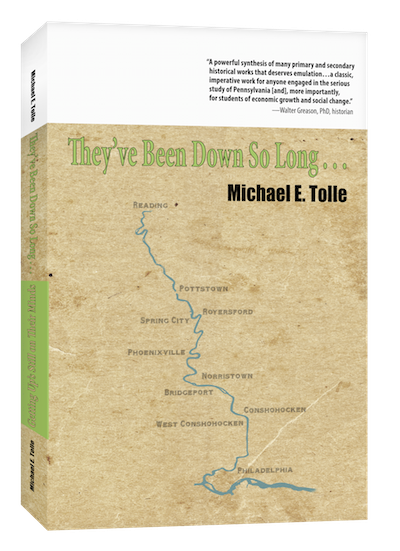 It's all very good and well to speak, as I did in my previous post, of a century of growth and prosperity for the boroughs of the Schuylkill Valley and call them “The Good Old Days,” but can we select a date when they started to come to an end, a date after which “things began to go wrong”? The long answer is no. By this I mean that no carefully researched and inclusive academic study would ever allow itself to reach such a conclusion; there are just too many local variables. The short answer, however, is yes, as long as we recognize that any such date—a boundary between historical eras—is both arbitrary and imaginary, and whose only reality is as a marker of very deep waters. It’s a guide, not gospel, but it helps to put things in perspective. 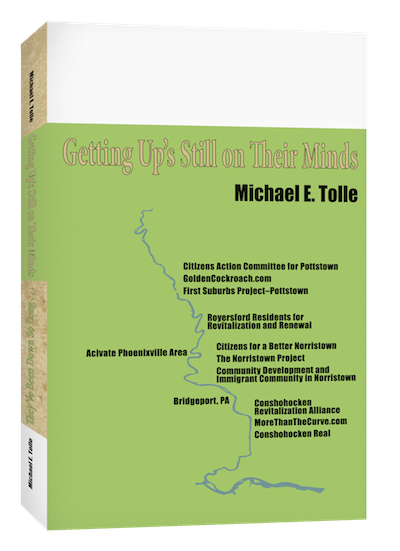 So here is my thesis: “things began to go wrong” for the boroughs along the Schuylkill River (and by no means them alone) after the Second World War. It took time for this to show up on the local level, because the seeds were laid by actions of the Federal Government in the years immediately after the war. In fact, borough downtowns seemed to undergo a revival just prior to 1950, with the end of rationing and the switchover from war to civilian production meeting the long-anticipated “pent-up demand” of people who had done without during the Depression and the war. This was pure inertia, however, in the period when people had no more options than they had always had, and thus shopped in the same locations they always had. An upcoming post will discuss the actions of the Federal Government in the post-war period, to outline just how badly the cards came to be stacked against our urban areas. By 1950, the river boroughs had begun to notice that things were changing. If you had driven across the DeKalb Street Bridge into Norristown in 1950, the first sight to greet your eyes would have been old, abandoned factories along the water’s edge. They had once housed Norristown’s thriving textile industry. Technological change (and the search for cheap labor) had long before hit that local industry hard. The true nature of things had been postponed by the wartime demand for soldiers’ clothing, which had by then ended. You might be asking yourself “how can this be?” Wasn’t the 1950s that era we refer to longingly when we point out unpleasant economic or social facts about today? Wasn’t it the era of real men and real steel, the start of “The American Century,” when U.S. products and military might bestrode the world (except for the Communist world, of course)? Don’t we long for the days when Ward Cleaver came home from his steady job in a good enough mood to appreciate stay-at-home wife June’s immaculate appearance, neat-as-a-pin housekeeping and carefully prepared meals? Back then “made in Japan” was a comedian’s punch line, and China an economic nonentity, right? Actually, yes to all of the above, up to a point. The late 1940s and early 1950s were the takeoff period for a time when a larger portion of the human race achieved an higher level of economic well-being than had ever happened before in the history of man. The U.S. was at the center of this, and the prime mover. That must not be forgotten, and should always serve as context for what I write later, but the economic prosperity and social stability of the 1950s that now casts such a rosy glow on our national psyche did not reach every level or location of society. The unpleasant historical reality, in fact, is that for America’s urban areas, large and small, the engines of this economic miracle delivered not growth, but decline; not prosperity, but decay. Some evidence of this thesis, again from Norristown history, and one of the reasons I choose 1954 as Norristown’s turning-point date: in that year the Commissioners of Montgomery County purchased two buildings adjacent to the Public Square. These were the very core of downtown. They occupied the lots labeled #1 and #2 for the first sale of properties in “The Town of Norris” in 1785, and had occupied prize positions of place in a long-prosperous downtown. 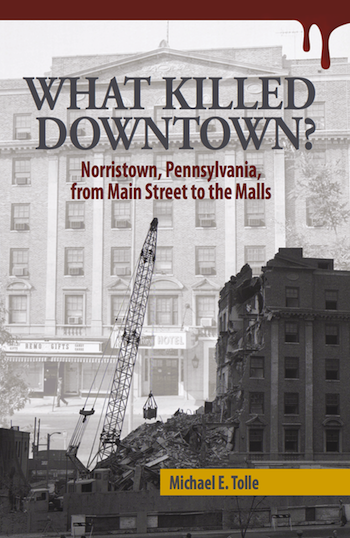 As I relate in my book, this was not so much a decision on the County’s part as a decision to avoid making a decision; much uncertainly lingered around downtown for a long time, doing considerable damage. Still, although continuing to examine other alternatives, the County Commissioners had elected to purchase Main Street properties. These very same County Commissioners (two of them, anyway) were Republicans, who, if their claims for fiscal probity are to be believed, threw nickels around like they were manhole covers. They were not about to pay much for property they were not sure they even wanted in the long run. There were also no other reported bidders for the properties. The actual numbers involved are unimportant, rendered moot by decades of inflation. The implication, however, is clear: by the early 1950s even choice Main Street properties no longer had the value they had displayed for so long. By the 1950s, that value was to be found in the suburbs, not the towns and cities. The Cleaver family lived in the suburbs, as did the Andersons and the Nelsons (OK, the Nelsons were a little upscale). Our national TV-inspired nostalgia over the 1950s derives from our memory of those too-good-to-be-real families in the equally idealized suburbs. Even then, some reality could be found on TV, at least in how it represented life in the city. The Kramdens lived in the city. Compare the set representing their apartment to those representing the homes of the Cleavers, Nelsons and Andersons. See the difference? That difference would grow. We have by now gone as far back in history as we are going to go. This is an artificial stopping point to be sure, but I had to select one somewhere, and “after the war” has a sound factual basis. From now on we will be moving ahead chronologically, but for the area’s urban centers, it will be all down hill. The story begins with the Federal Government, but my next post on this subject will be one last look at “The Good Old Days,” and why the concept is a myth.